When it rains, it pours. With multiple storms throughout the week, this was sure to be high water. It was, and we had a bit of fun with it. 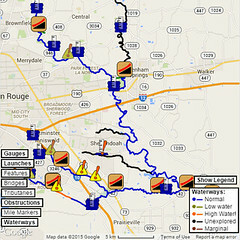 We’d been watching the USGS gauge on Bayou Fountain at Bluebonnet all week. It had been *quite* high, indeed, and looking at it, we knew it was going to be a bit of an interesting day on the water. When we arrived at Highland Road Park, we noted that the gauge was reading 8.3 feet — by our estimates, that would be right to the bottom of the bridge. 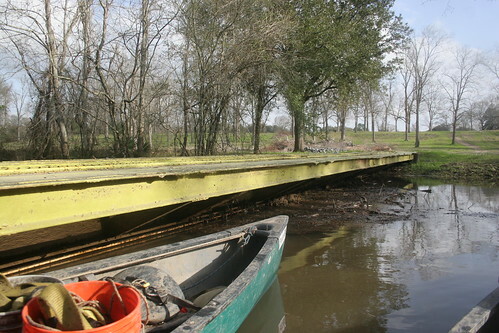 Putting the phone away, we walked over to the bayou to check the markings on the chain gauge by the launch point. Sure enough, the water was right at the T, meaning water lapping at the bottom of the bridge. This time around, we were met by a couple more people in a nice Hobie kayak who were coming along for the trip. The first thing we noted at the water’s edge was that the tree trunk that had been just upstream of the launch point was no longer in the vicinity. That would be something to watch for. On the other hand, the actual launch and recovery was going to be quite a bit easier than usual, as instead of a steep six-foot slope, there was just a slight dip to water level, maybe a foot and a half. With everyone launched, we headed on downstream. It didn’t take long at all to be at the bridge. At normal water levels, we can stand tall in the canoes and make it through without even ducking (or just a slight nod some days). The last few weeks, we’ve been having to bend down or even crouch in front of the canoe seats to just scrape by. This time around that was simply not an option. The 8.3-foot reading and T-mark on the chain gauge both proved to be quite on the money, as there was no air gap between the bottom of the bridge and the top of the water. Instead of breezing or scraping by below, we had to go over the bridge, but it was not a terrible inconvenience. The wall was all but completely submerged, showing just how much higher than normal the water was. Beyond the wall, we entered the last two miles of Bayou Fountain, most of which has low banks which are quickly inundated. The current was actually not bad. In fact, it was all but imperceptible for a good portion of the run, as the surface width of Bayou Fountain at this week’s level is extreme. We worked our way through several small transient blockages and brushy sections, some of which were certainly harder to pass due to the water depth (or should I say canoe elevation). We’ve got some work to do on some of them, but we need the water to be lower so we can reach them. At last, we made it through the last of the brushy area. 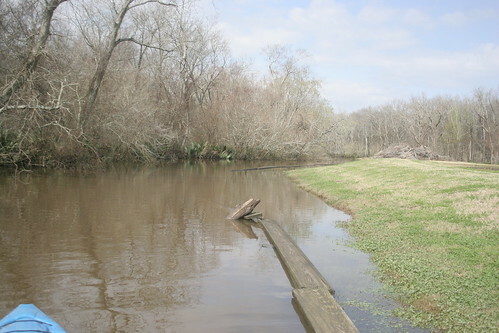 As we entered the last section of Bayou Fountain, where the bank rises on the left and the point approaches on the right, what had been a wide, lazy bayou was all collected together into one rather nicely flowing channel (with banks on both sides!). The current in the last half mile or so was about 2.5 miles an hour, and it was rather enjoyable to be moving at a nice clip. Of course, for those of us returning to the park, it was going to be a fun start upstream, but hey. About 4.5 hours after we left Highland Road Park, we were celebrating in Bayou Manchac. We said our goodbyes to our kayak friends, who were doing a staged-vehicle trip, and headed back upstream. The current was stiff, but it wasn’t that far. Once we were back to the brushy area, it vanished as if by magic, and we got back to work. At a few points the bayou was so spread out, we had to read the trees to know what was the bayou and what was the bank (also easily verified by plunking your kayak paddle down vertically — if it hits mud within a few feet, that’s bank; if it disappears completely, that’s the bayou, which gets quite deep near the end). 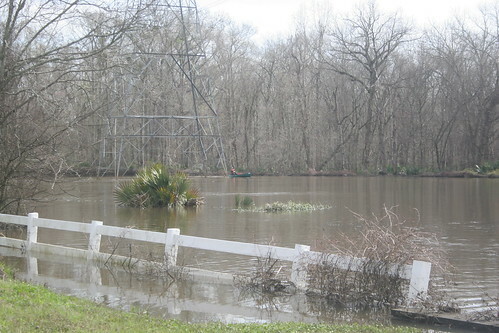 We can now officially say that Bayou Fountain is “passable” between Highland Road Park and Bayou Manchac. You can get a canoe or kayak through, but you will run across some floating logs or relatively small patches of collected flotsam. We’re continuing to work those, and once the water returns to its normal lower level, we’ll be able to finish off the causes of a few of the remaining problem areas (and take care of #11, the zombie logjam). Once we’ve got all that done and have verified that it’s stable, only then will be confident using the word “clear”. So, not “clear” yet, but definitely “passable”, and continuing to improve. Gradually, we’ll be moving from just clearing the way to also cleaning the litter, which is a job that’s only just begun. 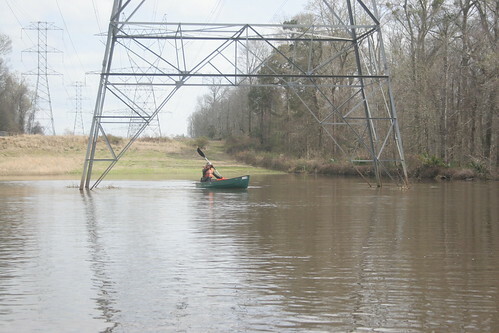 Also, we’ll continue to enjoy the bayou and all the amazing things you get to see when you’re out there (which this trip included a bald eagle at the first power line crossing). Here’s hoping we’ll have some drier weeks soon.